Fleer & Raban (2007) notes that science teachers generally feel underprepared to teach science at the early years stage and argues for the importance of developing a philosophy for pedagogy that pays more attention to schooled or scientific concepts. The importance of science teaching cannot be underestimated in a country such as South Africa that has been noted as being unable to keep up with the ‘average levels of science attainment in certain other industrial and technologically developed countries’ (Wilcox, On Mathematics education in SA and the relevance of popularising mathematics, 2003:9). Indeed, South Africa is still struggling to increase its basic literacy and numeracy levels as its apartheid legacy has left it with numerous shortages, not only in facilities and resources but also in skilled mathematics and science teachers (Wilcox, On Mathematics education in SA and the relevance of popularising mathematics, 2003). Research (Asoko in Cambridge Journal of Education, 32:2, 2002; Driver in Educational Researcher, 23:5–12, 1994; Fleer, 2009) indicates that the mediation of scientific (schooled) concepts is necessary for conceptual development. The acquisition of school-based concepts in the Foundation Phase (Grades 1 and 2) in the Beginning Knowledge unit of CAPS (Curriculum Assessment Policy Standards) pertaining to science teaching is of special relevance to this chapter, where we discuss the science teaching pedagogy of two foundation stage teachers. 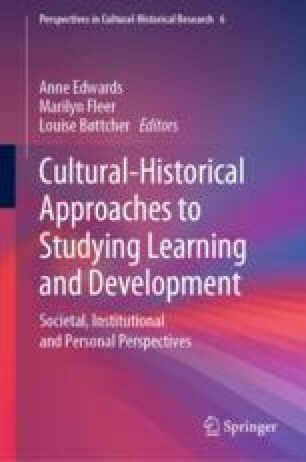 We conclude that the Vygotsky-based radical-local approach to curriculum and pedagogy developed by Hedegaard and Chaiklin has much to offer how science teaching is approached in ways that respect cultural heritages in South Africa and enable the decolonising of the current curriculum. Biology Online. (2014). Retrieved January 7th 2018: http://www.biology-online.org/dictionary/Aquatic. Curriculum Assessment Policy Statements. (2011). Retrieved 20th January 2018. http://www.education.gov.za/LinkClick.aspx?link=419&tabid=54&mid=1270. Muwanga-Zake, J. W. F. (1998). Is Science Education in a crisis? Some of the problems in South Africa. Rhodes University. Retrieved January 17th 2018. http://scienceinafrica.com/old/index.php?q=scicrisis.htm. Wilcox, D. (2003). On Mathematics education in SA and the relevance of popularising mathematics. Retrieved 17th January 2018. www.mth.uct.ac.za/~diane/on_math_ed_in_SA.pdf.